The golf equipment market is extremely competitive with many great manufacturers fiercely fighting for a bigger slice of the pie. As drivers are normally the most expensive piece of equipment in the golf bag, and the one that affords the greatest bragging rights, it is a hotly contested area. While some manufacturers focus on a niche segment, others try and go for more of a one size fits all approach. In this TaylorMade SLDR golf driver review, we’ll dig deep under the surface of the club to find out what makes it so great. Let’s start from the beginning! Ever since TaylorMade revolutionized driver design in the late 70s with their cast stainless-steel driver, the “Pittsburgh Persimmon”, they have continued to innovate and put huge resources into research and development. As a result, they have consistently produced some of the finest drivers on the market for the past few decades. The TaylorMade SLDR is no exception. 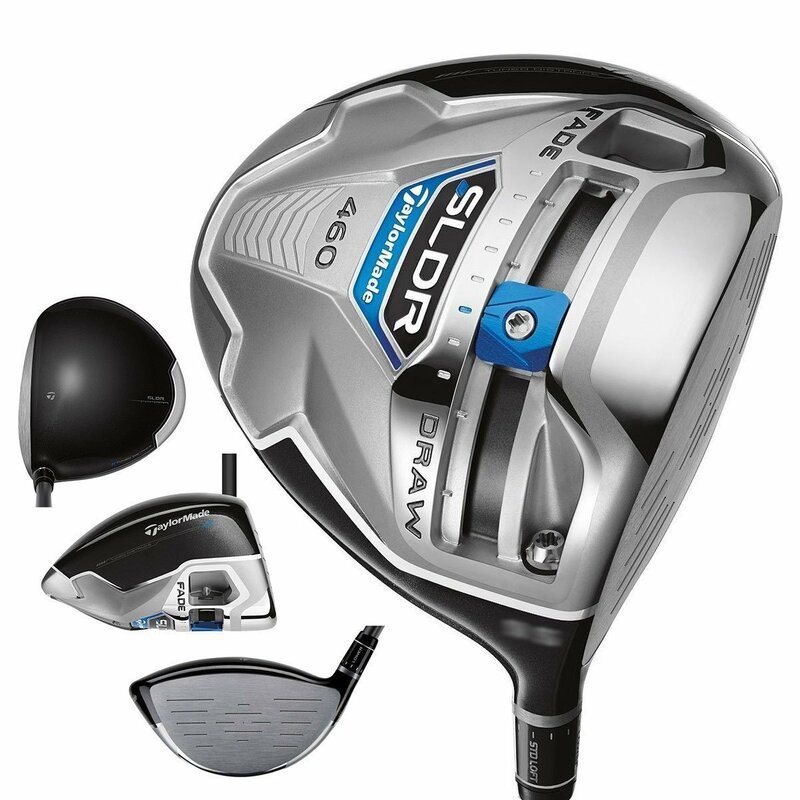 The SLDR replaces the very popular and successful R1. Although it is a great driver, TaylorMade listened to the feedback and acted on the few criticisms given to produce an even better driver, the SLDR. The result is an easy to swing, highly forgiving driver that produces great distance. The launch angle will suit most golfers, particularly those with a slightly slower swing and will give you good ball speeds with low spin. It has proved to be a very popular driver with many happy golfers reaping the benefits of the design enhancements. The main thing you can expect from the SLDR is a respectable distance off the tee. At the same time, your accuracy should put a smile on your face. Like many modern drivers, adjustability is a big factor. Most golfers appreciate the ability to be able to tweak the settings so suit their swing, adjust their launch, play a draw of fade, compensate for the conditions on the day, or help to minimize any weakness in their swing. What TaylorMade have done with the SLDR is make these adjustable mechanisms that much easier to understand and work with. The sole of the 460cc titanium head carries a 20g weight which simply slides on a rail that runs from the toe to the heel, depending on your requirements. The feature will have a noticeable effect on the ball flight and it really could not be easier to use. Another benefit of the redesigned technology is that it has reduced the weight of the head, allowing for better clubhead speed. It is probably best to experiment a bit at the driving range to better understand the effects of the adjustments and find what works best for your needs. TaylorMade claims it provides up to 30 yards range on your shot shaping although some testers found it to be slightly less than this. Either way, it will certainly help. The low spin might also take a bit of getting used to so again, a few buckets at the range will help you come to terms with this. Once you are used to it, you will find how beneficial it can be to your driving. The center of gravity is low and forward which will give you low spin, an effortless launch, and high ball speeds. The clubface is large and provides ample forgiveness. Their goal was to produce a driver that will provide great dist﻿﻿anc﻿﻿e by providing more loft with minimal spin and most players and testers agree that the achieved this admirably. At the same time, it is hard to fault the forgiveness of the driver. The SLDR also uses Loft Sleeve Technology to allow you to adjust the loft according to your style and swing speed. The SLDR is available in lofts of 9.5˚, 10.5˚, and 12˚. Shaft options are the Fujikura Speeder 57 shaft (available in M, R, S, or X Flex) or the TP version that sports a Fujikura Motore Speeder TS 6.3 shaft. The grip is the familiar and comfortable TaylorMade TM 360. The SLDR is designed for accurate distance off a low but effective launch with low, low spin. In addition to this, it remains highly forgiving. Adjustment is simple and effective, allowing you to shape your shots or tweak your weaknesses. Slower swingers, in particular, will benefit greatly from the set up, however, it is suitable for the bulk of the golfing market. If you can get fitted for this driver it will certainly help, otherwise, a bit of time getting to understand the functioning better will be of great benefit. After steadfastly sticking to a white head finish for some time, TaylorMade has gone for a bit of color with the SLDR. The crown is a more traditional glossy charcoal gray which looks classy and elegant and will appeal to most players. It contrasts perfectly with the silver face. It has a compact, neat appearance at address with an effective alignment aid with little in the way of distracting graphics. The signature weights are blue and complement the logo. The movable weight is blue and matches the SLDR logo. The SLDR produces a rather medium to high-pitched sound on impact but it is a powerful sound and by no means tinny. It does not have the lightest head but you do not feel like you are swinging a brick, it works well and the weight placement and design have the desired effect. Low spinning drivers often feel a bit rigid but you will enjoy a smooth, solid swing with the SLDR. The SLDR has proved to be a popular choice for many golfers and the design, weighting, and adjustable options combine well. Distance is superb, forgiveness is great, and it is a pleasure to use. It is simply a great driver. May the fore be with you!